I decided to participate in Heidi's Friday Night Stitch-In with the hopes that I would start to see some real progress on Richmond Sampler. Well, I can honestly say that I am approaching the end of the top border and could not be happier. I am enjoying Richmond Sampler, but I must admit, I am tiring of the border flowers. I am ready to move on to other things...like the house! Please excuse the terrible photos...the house is dark because of the shade trees surrounding the house. Also, my camera is old, tired and a bit crotchety. The flash, especially, was not cooperative. The scissors, scissor fob and frogging tool were all birthday gifts from DH. Here is a close-up of what I got stitched last night. As I mentioned I finished the flower in the center and began the flower on the right. I just have to finish the flower on the right and one more flower in the top right corner (where my needleminder is) and I will be finished with the flowers on the top border...woo hoo! In case some of you are wondering...I have not been stitching the queen stitches in the border or the flower pots. I have decided to wait until I am finished with the cross stitching to finish the queen stitches. I decided this because I noticed that the queen stitches were getting a bit crumpled and crushed. So, I will stitch them last. Yesterday was a bit busier than I anticipated so I only had about three hours to stitch and as I mentioned earlier, I was able to at least finish one flower and start another. There was a salvage sale at the University where I work part-time as a docent. They are getting ready to remodel one of the academic buildings and basically everything (desks, bookshelves, filing cabinets, etc.) was on sale. DH and I got a 6'3" bookcase and computer desk for...are you ready for this...5 DOLLARS! Yep! You heard right. We borrowed our pastor's truck, loaded 'em up and brought 'em home! I am so excited to have a new computer desk! Our current desk leans to one side and honestly, if a stiff wind came through, I am not sure that it would survive! Also, the large bookshelf will come in handy because we are both book lovers and have way too many books stored in boxes. Now we can put them out and maybe actually USE them! Stay cool everyone...till next time! Richmond is looking great! I can relate to the weariness of doing the same flower over and over...I had to put Sarah Woodham down for a bit before I set fire to it and ran over it with the car for good measure! Your Richmond Sampler looks great! Hang in there with the flowers! Richmond Sampler is looking very pretty so far :) Congratulations on getting new furniture for peanuts - great bargain! Just beautiful!!!! Hey, you should go for it and start on the inner stuff. You can alternate between the two, right? :D Congrats on the great furniture bargain! Your Richmond Sampler is looking gorgeous. Great score on the computer desk and bookshelves. You can never have enough bookshelves. Beautiful work - looking forward to the end result - found you through Heidi's FNSI and will be following. Along with quilting, cross-stitch is another of my passions, and I work on something most evenings - keeps the hands busy and away from the snacks LOL. Richmond Sampler is stunning~ I love this flower border...Pace yourself. And, what a deal you guys got...for 5.00...are you kidding me?...wow, good for you~! Your Richmond Sampler is looking lovely at the top! Go Valerie! Congrats on your furniture from the salvage sale! Good going! You are making great progress on the Richmond Sampler--I'd leave the queens for last too if they're getting crunched. I leave my satin stitching for last for the same reason--it was getting crushed. What a great deal you got on furniture! Your Richmond Sampler is wonderful. Love it. 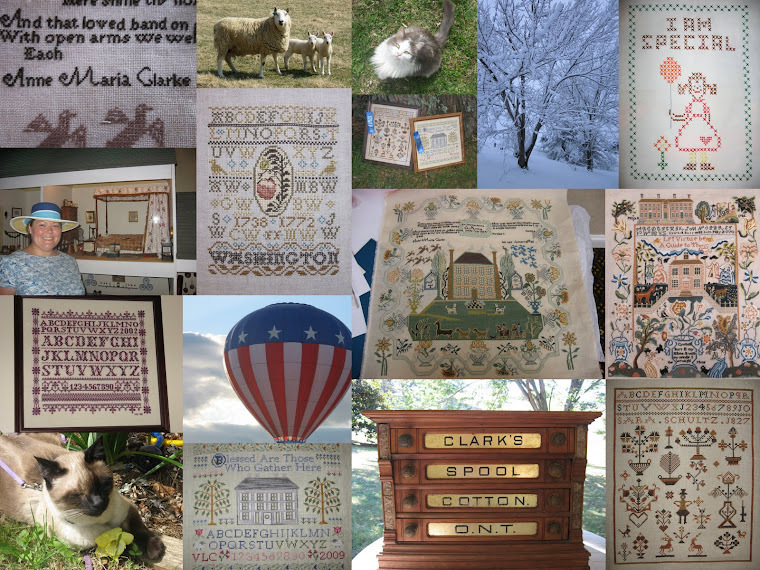 Your sampler will be gorgeous! I love the border. I was just saying the other day the border is one of my favorite things to look at on a sampler but one of my least favorite to stitch. Beautiful gifts from your husband! The samplers looks great, its really growing. On a probably lame note.... I can see that you use a lovely beaded scissors keep - what is the other beaded item in the photos? This sampler is so pretty! Good deal on the office furnitures. Lovely progress on your sampler. It's a beautiful design.